Among my thousands of cookbooks, some ingredients are called out so often that they don't even raise an eyebrow. Want apple recipes? Give me an hour: I can get you hundreds. Got a hankering for tomatoes? Wait right there; thousands of suggestions line my shelves. Ditto salt, onions, and garlic. Even the once-exotic fresh ginger is a grocery store staple now. Yet the old books or those printed in far-off lands occasionally toss out a casual mention of once-common ingredients that can make many modern Western readers pause. Such may be the case with long pepper. In the third century B.C., Theophrastus wrote that there were two kinds of pepper: black pepper and long pepper. Nearly four hundred years later, Pliny described and gave prices for three: black pepper, which cost 4 deniers a pound; white pepper, which cost 7 deniers a pound; and long pepper, costing 15 deniers a pound. Almost two thousand years later on, two of Pliny's peppers are still with us, but the third — long pepper — seems to have disappeared. Keep in mind that the Hymens were writing in 1980. Modern eaters' tastes have evolved somewhat since the days of Devo, Joy Division, and Captain Beefheart. The good news is that this exotic spice has crept into circulation in the West again — and is it not nearly as expensive as in the days of Pliny. Though online merchants carry it, I bought a 5-ounce package at a Dean Deluca store in Kansas on the clearance rack for about the cost of a cup of chai. In fact, a separate species (known variously as Piper officinarum or P. chaba or P. retrofractum) grown in Indonesia is available to modern cooks as well. The latter is longer than the Indian variety and tastes better. 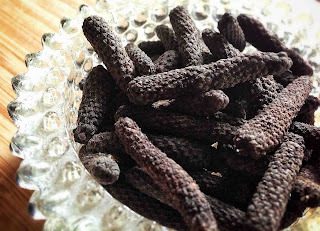 Unlike the miniature cannonball-shaped black peppercorns so familiar to us, long pepper is shaped like little cattails or perhaps long, very tightly closed pinecones. These small greyish brown-black spikes consist of a number of tiny seeds adhering to a core. On opening a jar, its musty, piquant smell immediately fills the space suggesting exotic blends more than a single, dominant spice. The taste is a bit like black pepper; it has more heat and a bite, anyway, but there's a sweet lingering undertone. Crush it in a mortar, cook with it whole, or grind it as you would black pepper. In their essay Long Pepper: A Short History (included in The Wilder Shores of Gastronomy, see below), the Hymens detail the origins and fall from popularity of the spice. In a nutshell, they argue that in the ancient and Renaissance worlds, long pepper provided heat in dishes. When chile peppers arrived from the New World and took root all over Europe, demand for such piquant notes was easily satisfied by relatively local crops, rather than by pricey imports. The market simply withered away. By 1702, they report, a French writer declared "I have nothing to say about long pepper since it is no longer used with food." Don't tell that to Zakary Pelaccio whose Fatty Crab restaurants in New York serve drinks as good as the Malaysian-inflected food. 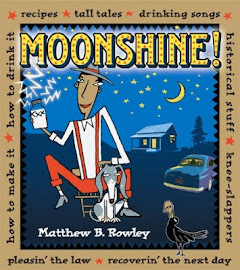 His book Eat With Your Hands includes a recipe for a black pepper/rhubarb pickle which he exhorts readers to make with long pepper if they can get their hands on some. Combine the reserved rhubarb peels with the sugar and 1 cup water in a small saucepan. Bring to a simmer, stirring, until the sugar is dissolved, then strain into a medium saucepan, discarding the solids. Warm the syrup over medium heat until it's just hot to the touch, add the rhubarb and the black [long] pepper, and take the pan off the heat. Let it sit for at least an hour or up to many. Keep it in the liquid, covered, up to a few weeks in the refrigerator, until you're ready to use it.